For couples seeking the perfect venue that has the WOW factor and one that will have their wedding guests talking about for a long time then getting married underground could be just up your street! From old slate mines to limestone caverns, historical caves to spectacular underground chambers with varying temperatures; there is a vast array of underground venues dotted all around the world that hold wedding ceremonies. Those wishing to say their vows away from daylight can be for an assortment of reasons from being avid cavers who met and/or proposed whilst underground to just wanting a wedding that is out of the ordinary and unique. Getting married underground does not mean you have to dress in climbing gear and stand up to your ankles in muddy water with teeth chattering and shivering away during the ceremony. Far from it! In fact many venues have been enhanced to hold wedding ceremonies for couples to say their vows in breathtaking and wondrous places. The Jenolan Caves : One of Australia's most popular tourist attraction the Jenolan Caves were inhabited and named 'Binoomea' (dark places) by the Aboriginals thousands of years ago. 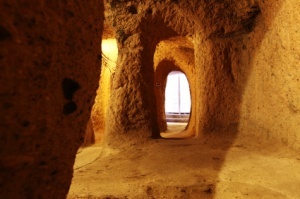 A truly ultimate venue to get married in the beautiful underground caves that have held weddings for many years. A bridal suite and accommodation for friends and family are also among the wedding packages. The National Showcase of Wales : Two large waterfalls cascade into an underground lake and are certain to give that perfect backdrop to your wedding photographs. Modern lighting and romantic music is set into the great hall of Cathedral Cave in this underground venue in South Wales. Carnglaze Caverns : Surrounding by breathtaking gardens these Cornwall caverns offer three cathedral proportions venues that were hand created by local slate miners. From a crystal clear subterranean lake of blue/green water to a spectacular terraced gardens and valley you will be spoilt for choice where to stay the longest. The caverns can cater from between forty and four hundred wedding guests. Llechwedd Slate Caverns : With temperatures of fifty four degrees Fahrenheit throughout the year, this Victorian working mine that is in Snowden, North Wales. Its spectacular underground lake, cathedral high chambers and impressive acoustics would create the perfect setting for you and your partner to express your vows. Luray Caverns : Further afield in Virginia in America these limestone caves have miles of formations along with a spectacular double column that have been given the nicknames of the Bride and Groom Formation right in the middle of where wedding ceremonies are held. With a nice temperature of fifty five degrees you won't have a worry on what the outside weather is like. Poldark Mine : This Eighteenth Century Cornish Tin Mine can facilitate up to twenty five guests in the Homan Chamber along with an evening function room so you and your guests would not need to travel after your wedding ceremony in candle lit surroundings. Are you able to decorate a section of the caverns yourself or perhaps they would do that for you? Is the lighting enough, or will you and your guests need to carry torches/lanterns? Check if any type of insurance will be required for you and/or your wedding guests. Enquire if children are allowed or if there is an age limit. Ensure your wedding will be legal when conducted underground. Find out about the type of marriage licence and/or documents you will need. If no facilities such as carpet or paved areas are supplied you may have to wear protective footwear or trainers. Will you have to provide your own or can they be obtained from the venue? Is safety headgear required and if so is it available to you and your guests? Make sure you and none of your guests suffer from claustrophobia. See what the dress code is. Many brides will be able to wear the full traditional wedding dress with the possibility of a shawl if the temperature is colder than normal. What is the maximum limit of guests allowed? Will your chosen venue be able to provide wheelchair access? Most venues offer packages that will ensure your wedding is legal and will give you full details on what you may wear and will cover all of the above information but if you are unsure about anything, just ask! Getting married underground does not mean you will be saying your vows in deep dark silent areas while having to crouch down and 'mind your head.' Many of the locations have caverns as high as fifty metres with natural lighting and places to dine and play music. Photographers can capture some of the most awesome pictures and memories can be built around a romantic, historical and mind blowing venue.